March Project Life Blog Hop ... Week 8. I love that number card above from the Sunshine edition kit ... great jumping off point and helps me add in little top bits of the week (much like a review of the week). 1.Routines/activities 2. Going to the Jets hockey game 3. making stuff 4. Laughing 5. Reading, Still Alice 6. Watching, House of cards on Netflix 7. Making time for us. 8. Adventuring 9. Loving 10. Sun shining. YES to all of that RIGHT NOW. This week - we went on a little weekend getaway to a Fave spot north of us in the woods to Hecla Resort, We go there in the winters and to the cabins in the summers and enjoy both seasons so much! I wanted to add that part of the story in this weeks spread separately so INSERT and Insert. I tried out something new and loved it also I took a full 12x12 page protector and took my 3x3 photo's I printed out put them where I wanted them to go and then sewn up the tops and sides of each pocket I created (most likely there is a easier way to make this spread but again I like doing it myself). It turned out the way I hoped. I Love this trips - each time we go it's the same road but different journey that we experience, That little person on the snow hill with the date stamped on it, that's me ... like I was shouting "we are here" to my self with my One little word being PURPOSE I think a lot more about "in the moment" what is the purpose of me on this hill in winter ... to be. So much fun to get out of town and just "be". While making the 3x3 pockets I wanted to add in one window, Also another fave thing to do in my pages. This one I used a word bubble wood veneer (another must on my spreads). That large number 8 is a cut out from my stendig calendar, Instead of using "title" cards this year I made a change and have been adding in these numbers with the weeks date stamped on it. Not sure if it will stick the whole course of 12 months and 52 weeks but right now it's working. This week I made that card from Ali Edwards digital brushes "Everday life cursive" found here. I am Thrilled to be on Ali's Creative Team this year & have been loving all the designs (as usual) I made the words appear like they were half on half off the 3x4 & only using the top half of the card the rest was filled in with my date stamp. "Make today Awesome" highlighted with a sharpie highlighter. Hello February card was a 4x6 I cut down and made 3x4. Adding on two labels from this months "Cirque kit". Full view of insert & right hand page. If you have been following me from last year you know that I LOVE these stamp sets from Elise Cripe and also have her digital stamps you can find those here. For the love of ... Snow, Right now, together, pools, hotels, road trips, sun, getaways. That giant Caesar was delicious a little spicy - but still delicious. I didn't finish it way too large for me. This week I added in my own brush script, Just took the original 8x11 and scanned it & printed it out on 3x4 in photoshop. During our little getaway we pulled over on the highway go out walked onto the frozen (totally safe) Lake and seen the most beautiful Ice exposed from the snow that covered it ... We all loved seeing "through" the ice & the kids just loved that we were standing on a Lake - they wanted to do some Ice fishing but told them that's a whole other day adventure as it was getting late and didn't bring that equipment on this trip. I LOVED the colour of that ice so awesome. At the hotel we LIVED in that pool, the kids totally woke up swimming and went to bed swimming. So fun to see them play in the water vs swim lessons where they have to do what the instructors ask of them - this was totally for FUN! Love that photo above of Tyler and Ava on his back & she is trying to push him under water. YES for the love of Road Trips. For the love of starting NEW projects like the knitting one I just started. Full view above with out Insert. That wraps up this week 8 of my Project Life. We had a busy week with the Jet's Hockey game (we won in OT), Our Hecla Trip, I started my first knitting project, Trips to the local library and reading Great books, watching house of cards and LOVE it, Work and school (my work schedule has changed to part time and I am adjusting to that), Kids activities, playdates, making plans for spring break, thinking about birthdays coming up around the corner. 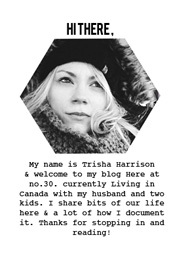 YAY my first Blog Hop post, thanks so much for making it all the way through this long post. I Hope it inspires you, Stop in again I share a lot of everyday life here & on my IG. *Please note that these are fun and optional blog hops. If you don't see your favourite former team member, please visit their individual blogs to see what they are up too! We hope you enjoyed this hop! If this is not your last stop on this March Blog Hop please check out more Inspiring pages from my friends (click on their names) If this is your last stop in the hop then I hope you enjoyed all the pages you have seen & see you next month! Cheers.